The Wild and Absolutely True Adventures of Meg: What a Wonderful Thing! Just when I start to think that our world is a lost cause, I have an experience like the one I had yesterday. I was at Mom and Dad's, and my lovely day started when I awoke to hot pancakes and bacon for breakfast. 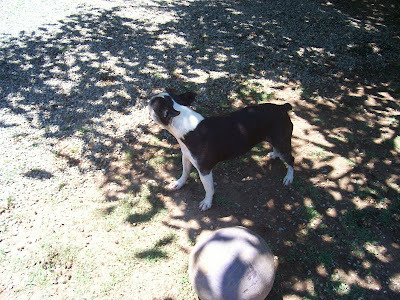 As I was eating, Dad told Mom and I about something he'd seen on the local news that morning, about a local farm that took in unadoptable animals and gave them a happy home for the rest of their lives--however long that may be. They were featured on the news because they were having an open house in hopes of raising some money. As it was only fifteen minutes or so from where Mom and Dad live, we decided to check it out. We arrived at A Chance For Bliss (take a few minutes to look at their web site--it's wonderful, with lots of pictures) and found it to be a tidy, well-kept little farm with a couple of comfy pastures, a ton of big, shady trees, and a motley crew of horses, cows, geese, ducks, dogs, cats, and potbellied pigs. Each and every animal is special, and each and every animal is considered "unadoptable" because of various problems they have or had. Take Woody, the dog. 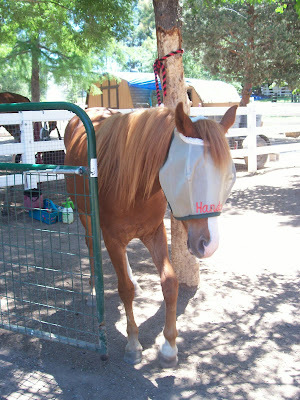 Shortly after he arrived at his new home, both of his eyes had to be removed because of disease. Most people would give it up for a loss, but not A Chance For Bliss--Woody is a happy dog with plenty of happiness in his life. Or take Handsome, the spokespony. He was born with a clubbed hoof and was to be put down...until these wonderful people took him in. The University of California, Davis did a pro bono operation (they are a veterinary school, so I'm sure it was a great opportunity for student vets to watch) and Handsome is now good as new. I saw him yesterday, and there is no sign he ever had a bad hoof. He's not only handsome, but he's full off life and energy. We spent a lovely hour talking to the owners and their volunteers, petting all manner of creature, and enjoying the peace and tranquility that these people have created for these special animals. If I move up to that area, I might just start volunteering my Sunday mornings to helping groom and scooping horse poop. I took a few pictures (of course!). 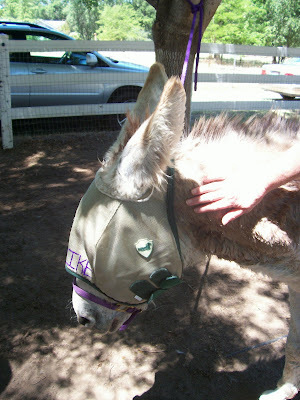 This is Spike the donkey--when he came, his hooves had never been trimmed, and were so long, they actually curled under--very painful! He's just fine now, and a sweetie. 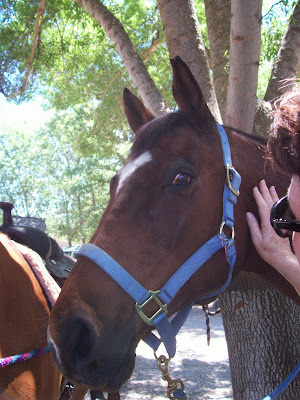 Mom fell for Eddie, a former racer who used to fall asleep when working at a riding school for disabled children--turns out he was just bored! Handsome--the official Spokespony. It was that right front that was clubbed--can you tell? Nope.